* Dit is het aanbod van Clarion Ultimatum uit Shards of Alara. Als een kaart in meerdere series zit kun je die apart aanklikken hierboven. Klik op de getallen om direct naar iemands collectie te gaan. De leden die het meest recent zijn ingelogd staan bovenaan. Leden die meer dan 14 dagen niet zijn ingelogd worden niet vermeld. Oblivion Rings en Journey to Nowhere opzoeken helpt ook wel. Deze is nog best leuk met elke willekeurige landfall kaart. Verder niet echt een boeiende kaart. This spell has no targets. 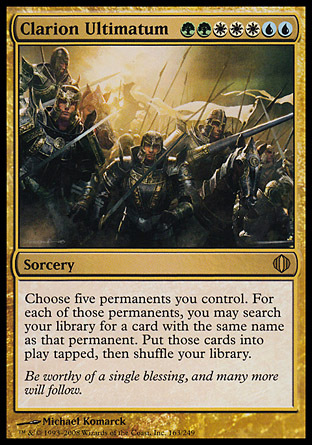 You don’t choose five permanents you control until Clarion Ultimatum resolves. If you control fewer than five permanents at that time, choose each permanent you do control. The five permanents you choose must all be different. However, some of them may have the same name as one another. For example, you may choose two Empyrial Archangels and three Plains. If you do, you search your library for up to two more Empyrial Archangels and up to three more Plains and put them onto the battlefield tapped. If you choose a permanent whose name has been changed by an effect (for example, a Clone that’s copying another creature), you’ll search for a card with the new name, not one with the original name. Note that changing a land’s subtype doesn’t change its name. If you choose a permanent with no name, such as a face-down creature, no card in your library can be found with that name. The cards all enter the battlefield at the same time. If one of the cards that’s entering the battlefield is an Aura, it must enter the battlefield attached to a permanent already on the battlefield. It can’t enter the battlefield attached to another permanent entering the battlefield via Clarion Ultimatum. If an Aura can’t enter the battlefield this way, it remains in your library. If you find a card that isn’t a permanent card while searching (for example, you chose an Illusion token and find the split card Illusion/Reality), that card remains in your library. We hebben alle decks op de site voor je doorzocht en gekeken welke 20 kaarten het meest met Clarion Ultimatum samen worden gespeeld.